The term Financial Derivative is a very broad term which has come to mean any financial transaction whose value depends on the underlying value of the asset concerned. Sophisticated statistical modelling of derivatives enables practitioners in the banking industry to reduce financial risk and ultimately increase profits made from these transactions. The book originally published in March 2000 to widespread acclaim. This revised edition has been updated with minor corrections and new references, and now includes a chapter of exercises and solutions, enabling use as a course text. Comprehensive introduction to the theory and practice of financial derivatives. Discusses and elaborates on the theory of interest rate derivatives, an area of increasing interest. Divided into two self-contained parts ? the first concentrating on the theory of stochastic calculus, and the second describes in detail the pricing of a number of different derivatives in practice. Written by well respected academics with experience in the banking industry. A valuable text for practitioners in research departments of all banking and finance sectors. Academic researchers and graduate students working in mathematical finance. Philip Hunt is the author of Financial Derivatives in Theory and Practice, Revised Edition, published by Wiley. 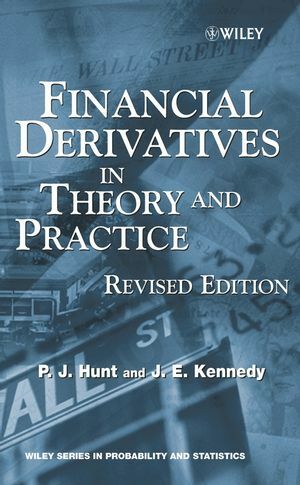 Joanne Kennedy is the author of Financial Derivatives in Theory and Practice, Revised Edition, published by Wiley. 1.1 Option pricing in a nutshell. 2.3 Basic properties of Brownian motion. 3.1 Definition and basic properties. 3.3 Stopping times and the optional sampling theorem. 3.4 Variation, quadratic variation and integration. 3.5 Local martingales and semimartingales. 3.6 Supermartingales and the Doob—Meyer decomposition. 4.3 Stochastic integrals: the L2 theory. 4.4 Properties of the stochastic integral. 4.6 Stochastic calculus: Itô’s formula. 5 Girsanov and Martingale Representation. 5.1 Equivalent probability measures and the Radon—Nikodým derivative. 5.1.1 Basic results and properties. 6.2 Formal definition of an SDE. 6.3 An aside on the canonical set-up. 6.4 Weak and strong solutions. 6.5 Establishing existence and uniqueness: Itô theory. 7 Option Pricing in Continuous Time. 7.1 Asset price processes and trading strategies. 8 Dynamic Term Structure Models. 8.2 An economy of pure discount bonds. 8.3 Modelling the term structure. 9.2 The real world is not a martingale measure. 9.4 Local versus global calibration. 10 Basic Instruments and Terminology. 10.6 Discount factors and valuation. 11 Pricing Standard Market Derivatives. 11.2 Forward rate agreements and swaps. 12.3 Characterizing the futures price process. 12.4 Recovering the futures price process. 12.5 Relationship between forwards and futures. Orientation: Pricing Exotic European Derivatives. 13.3 Example terminal swap-rate models. 13.4 Arbitrage-free property of terminal swap-rate models. 14.2 Valuation of ‘convexity-related’ products. 15 Implied Interest Rate Pricing Models. 15.2 Implying the functional form DTS. 15.5 Numerical comparison of exponential and implied swap-rate models. 16 Multi-Currency Terminal Swap-Rate Models. Orientation: Pricing Exotic American and Path-Dependent Derivatives. 17.3 Parameter fitting within the Vasicek—Hull—White model. 17.4 Bermudan swaptions via Vasicek—Hull—White. 19.3 Fitting a one-dimensional Markov-functional model to swaption prices. 19.5.1 Log-normally driven Markov-functional models. 19.6 Relationship to market models. 19.7 Mean reversion, forward volatilities and correlation. 19.7.1 Mean reversion and correlation. 19.7.2 Mean reversion and forward volatilities. 19.7.3 Mean reversion within the Markov-functional LIBOR model. Appendix 1: The Usual Conditions. Divided into two self-contained parts – the first concentrating on the theory of stochastic calculus, and the second describes in detail the pricing of a number of different derivatives in practice. Now includes a new chapter of exercises and solutions, enabling use for self-study or as a course text. Text has been updated with new references and many corrections.